In a break with past practice, where Hi-Fi+ coverage efforts at CES and other shows have been both exhaustive and, to be honest, exhausting (as is, “Man, that’s a lot of gear to cover in not enough space…”), Editor Alan Sircom and I decided to narrow things down a bit and focus on what we regarded as the Top 10 new products (or groups of products) we saw and heard at the show. The second Top 10 list, which your eyes are scanning just now, focuses on Traditional Two-Channel High-End Audio. Here’s the thumbnail sketch. Chord’s digital audio design guru Rob Watts has long contended that, if he access to digital filters of infinite or at least ‘near infinite’ tap lengths, he could reconstruct an analogue audio waveform from 16/44.1 files that was every bit as accurate and musically nuanced as the analogue audio waveforms constructed from much higher res files. The big catch, of course, was that requirement for a digital filter of near-infinite tap length. How infinite is ‘near infinite’? Mr Watts’ mathematical modelling had suggested that a filter with upwards of 1 Million taps ought to do the job, but no such filter existed—until now. Thanks to the arrival of an extraordinarily powerful new Xilinx FPGA device (the XCTA200T), it became possible for Watts to develop a digital filter with a stonking 1,015,808 taps (! ), which Watts said represented a ‘Holy Grail of Digital Audio’ moment, in his view. For comparison, note that Chord’s original Hugo offered a digital filter with approximately 26,000 taps, while the critically acclaimed DAVE DAC features a filter with 164,000 taps. Watt’s new ‘1 Mil-tap filter’ lead to creation of a revised version of Watts’ famous WTA filter algorithm called the ‘WTA M Scaler’, which take full advantage of the new filter. Now here’s the vision: Chord’s Blu II is a CD transport/upscaler that is fitted with the new filter and the WTA M Scaler and is designed to ‘pipeline’ upscaled and pre-filtered data directly to Chord’s famous DAVE DAC, yielding what Chord describes as radically “redefined CD sound quality” and giving “unprecedented accuracy to CD playback.” Chord emphasises that this is not a rejection of high-res audio by any means, but rather a mechanism for transforming CDs (and 16/44.1 files) into high-res audio in their own right. The Blu II should become available in March 2017 and will sell for about £8,000. The Contour range of loudspeakers from Dynaudio occupies a position that is theoretically four slots down from the top-of-the-line Evidence-series models, but don’t make the mistake of thinking this means the Contour models are somehow mere ‘mid-fi’ offerings. On the contrary, the Contours in general and the big Contour 60 floorstanding loudspeakers convey a very generous taste of the performance that makes top-tier Dynaudios so special, yet at a fraction of the price. This point was driven home to me in a compelling demonstration where the all-new Contour 60s ($10,000/pair) were driven by superb Octave electronics and sounded, well, a whole lot more expensive than they actually are. Perhaps these results can be attributed to the fact that in developing the new-generation Contour models in Dynaudio’s new Design Centre, the ‘Project Contour’ team was given, says the manufacturer, “free rein to experiment with materials, different techniques, and different designs.” This led to a three-way, four-driver floorstander fitted with Dynaudio’s best 28mm Esotar 2 soft dome tweeter, a 150mm MSP mid-bass driver, dual 240mm MSP bass drivers, an all-new crossover network featuring Mundorf capacitors, a solid aluminium front baffle with gently curved low-diffraction edges, and a handmade curved-wall cabinet enclosure. In terms of articulacy—especially in handling delicate high frequency details—the sound of the Contour 60 is highly reminiscent of that of Dynaudio’s more costly models, yet is possessed of a terrific quality of natural musical warmth that stands in contrast to the somewhat cooler, more overtly ‘Nordic’ sound of some of the firm’s premium-priced models. For many systems, budgets, and musical tastes, I suspect the Contour 60 offers just what customers may be seeking: a speaker with many of the benefits of top-tier models, yet with that always welcome quality of innate musicality that makes them work well, recording after recording. Ever since making the transition from TAD/Pioneer to ELAC, loudspeaker designer extraordinaire Andrew Jones has been on a roll, creating some of the most impressive value-priced loudspeakers we’ve ever encountered. 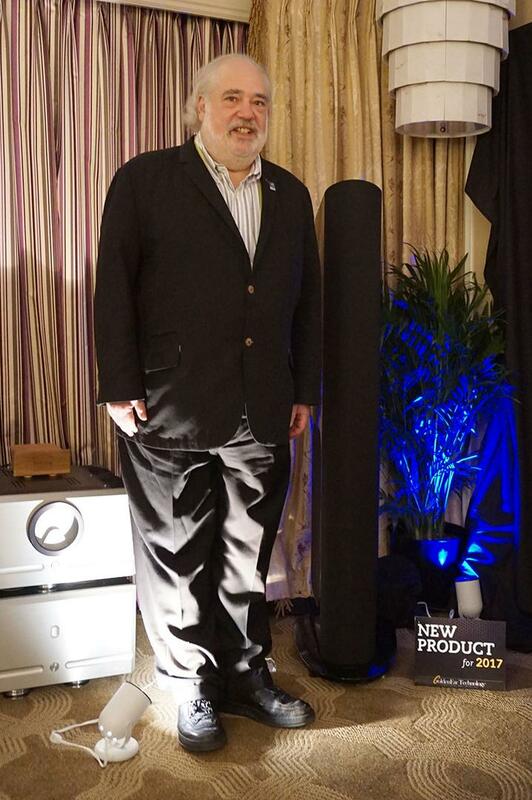 First came the Debut monitors and then the Uni-Fi models, but for CES 2017 ELAC took a much larger sonic step forward with Jones’ new Adante monitors, which will sell for $2500/pair. Having heard the Adantes toward the end of the show, I can see their point. This loudspeaker is going to stand all of our notions of what’s possible at the $2500/pair price point on their collective heads. And do you want to know the even scarier part? Despite the overwhelmingly positive response to the Adante at the show, Andrew Jones revealed that he’s not done with the model just yet because he believes he can wring yet more performance from the design, which is saying a mouthful. Expect to see the Adante arrive near the end of Q1, 2017, or just a bit beyond that timeframe. 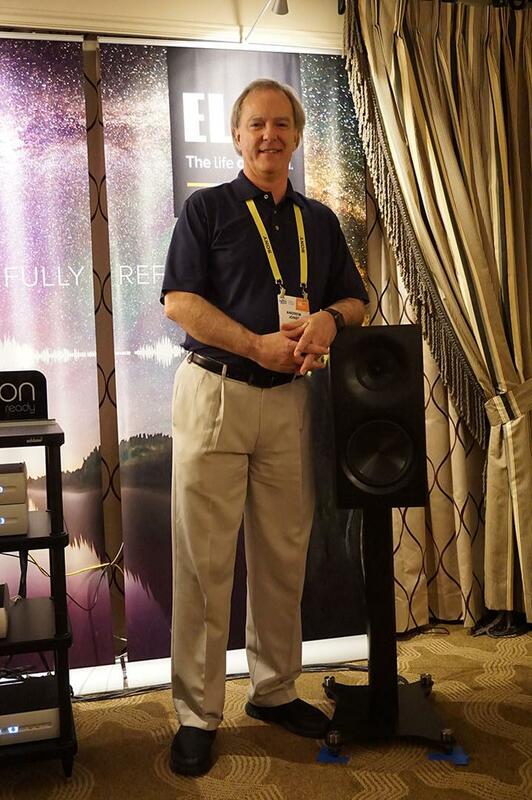 GoldenEar Technology claims as its slogan, “We Make High-End Affordable” and thus far that tagline has been borne out in Hi-Fi+ reviews of GoldenEar models such as the Aon 3 monitor, the Triton Five floorstander, and the then-flagship Triton One floorstander. As a rule this brand doesn’t build speakers down to a price, at least not in the usual sense, but rather seems to set specific sonic goals and then seeks to find the most cost-effective means possible of meeting those goals. · A quartet of side-firing 10.5-inch x 9.5-inch ‘inertially balanced’ passive radiators that were derived from the design of the firm’s successful SuperSubX powered subwoofer. Driving the low frequency section of the Triton Reference is a built-in 1800-watt, 56-bit DSP engine-equipped woofer amplifier that is fed through a Reference-specific balanced crossover network. And because the Reference contains built-in low-frequency amplification it is a relatively easy load to drive and one that can marry well great sounding but not necessarily high-powered upper-tier amplifiers. Finally, the cabinet of the Triton Reference was developed through extensive accelerometer testing, which was used to determine the most effective means of distributing internal cabinet bracing to minimise unwanted vibration. The result is a speaker that, based on a brief but telling listening session, sounds better than it has any right to for its price and that will give a number of higher-priced speakers very, very stiff competition. All the desirable high-end attributes are present and accounted for: taut, deep, and powerful bass with exceptional pitch definition; excellent top-to-bottom resolution and articulacy; precision imaging; and fine, three-dimensional soundstaging.